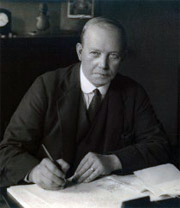 Archie Leitch in his Westminster office in the 1920s, at a time when he was working at Villa Park, Selhurst Park, Twickenham, Dundee and Newcastle, and was just about to start work at Derby, Portsmouth, Wolves and Hampden Park. No other architect or engineer has been so influential in any individual sport. 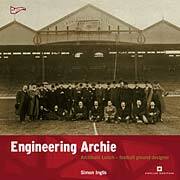 Engineering Archie's publication coincided with the 100th anniversary of the opening of one of Archibald Leitch's best-loved works, the Stevenage Road Stand at Craven Cottage, now a Grade II listed building and one of only 11 Leitch buildings surviving at British football grounds. For author Simon Inglis, Archibald Leitch was one of the most intriguing figures in British football history. He was also the man who inspired Inglis's career as a historian of the game. Two facts sum up Archie's career, says Inglis. 'If you look at the First Division table in 1927, of 22 clubs, 16 had been, at one time or another, clients of Archie. "Or think of the 1966 World Cup. Of eight venues used, six were grounds where Leitch had played a significant role. That is some legacy for an unknown engineer. In fact so interesting did that tale turn out to be that the book received thunderous plaudits from the press and was runner-up in the 2005 William Hill Sports Book of the Year Award, the first time that a design-related sports book had ever been shortlisted. Since the book's publication, Inglis has embarked on one further push for Leitch's work to be recognised. Firstly, Inglis has proposed the creation of an English Heritage blue plaque to Leitch, to be placed on the façade of the Stevenage Road Stand (now the Johnny Haynes Stand) at Craven Cottage. Also, Inglis has proposed to Fulham FC that a decorative ironwork finial be erected on the stand's pitch-side roof gable. An announcement on both initiatives is anticipated later in 2008. Engineering Archie is available now from our website, priced £14.99. 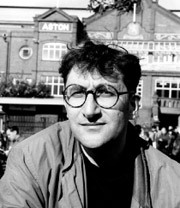 Simon Inglis, photographed outside Leitch's 1920s Trinity Road Stand at Villa Park in 1997. Inglis saw his first football match at Villa Park in 1962 at the age of seven, and has been on Archie's trail ever since. If you would like Simon to speak at your function, contact us and we will do our best to oblige.